Just off Interstate 80, this Iowa hotel is less than a 15 minute drive from downtown Omaha, Nebraska. All rooms come with free Wi-Fi and a cable TV. A work desk is provided in every room at American Inn Council Bluffs. Each air-conditioned room includes a telephone. 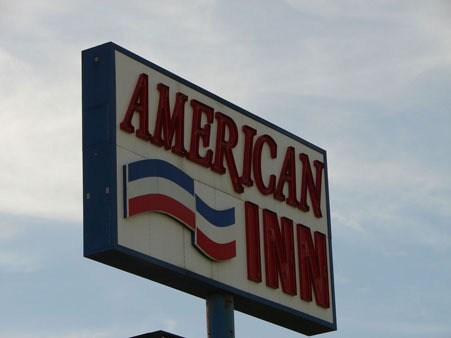 The front desk is available 24 hours a day at Council Bluffs American Inn. A laundromat is featured on site for guest convenience. The Mid America Center is one mile from this hotel. Horseshoe Casino is less than a 10 minute walk from the property. Free! Up to two children under 18 years stay free of charge when using existing beds. All further older children or adults are charged USD 5 per person per night when using existing beds. Extra beds are not available. Baby beds are not available. Additional fees are not calculated automatically in the total cost and will have to be paid for separately during your stay.